Today, AvantLink merchants and merchant parent accounts now have the ability to assign administrative and program management access to new users. Affiliates also gain the ability to get more specific with the permissions they assign to new admin users to their accounts. This handy new feature is called the Account Linker Creator and allows AvantLink users to directly maintain all aspects of their administrative relationships. Access to the Account Linker Creator can be found by logging into your account and clicking ‘Account>Manage Additional Logins’. From here, a full list of all user accounts linked to your program is displayed. Each user will show whether or not it’s active, the creation date and the last edit/adjustment date. 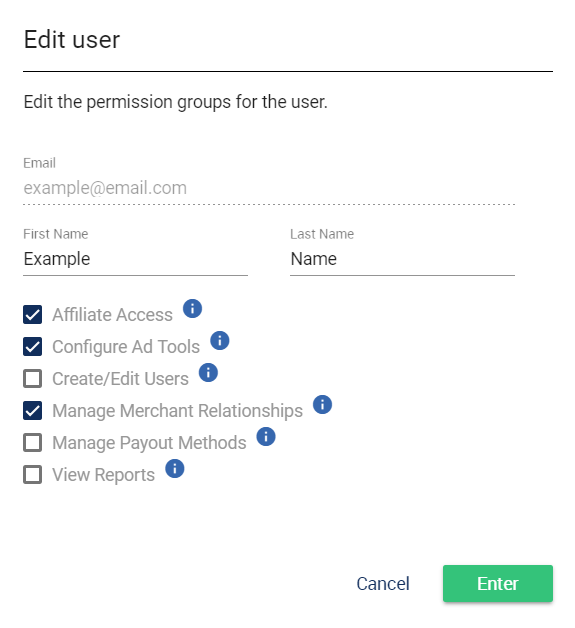 Merchant Access: Permission to access reporting, manage affiliate relationships, create/edit ad campaigns and other basic functionality within the AvantLink system. Create/Edit Users: Permission to create new user accounts and edit permissions for existing users. To enable this feature, the merchant access permission level must also be selected. Every merchant will also show a listing for a user named ‘AvantLink Disruptobot’ that cannot be removed. This “user” simply allows AvantLink administrative access. Merchant parent accounts tend to benefit the most from the Account Creator Linker. New users can be added to manage the entire suite of programs contained within the parent account utilizing the same permissions listed above. For agencies, OPMs and merchants with multiple programs, giving access to new users over all programs under their umbrella is far more advantageous than individual assignments. However, if new users only need access to a fraction of the programs within a merchant parent account, use the merchant-level user access/permission process listed in the section above. Affiliate Access: Permission for basic access to the affiliate account. Configure Ad Tools: Create and edit advertising tools for deployment on the affiliate website. Create/Edit Users: Create new user accounts and edit permissions for existing users. Manage Merchant Relationships: Establish new or terminate existing relationships with merchant programs. Manage Payout Methods: Add and edit methods for receiving commission payouts. View Reports: Access to all reporting, including performance reports. For both merchants and affiliates, all account users will show a creation date of June 13, 2018. While nearly all users accounts were created earlier, this date simply reflects when the Account Creator Linker tool was launched and those accounts were brought into that system.